NASA Scientists now have a better understanding of how carbon dioxide travels and spreads round our atmosphere, and indeed all over the globe. They were able to accomplish this simulation through a computer model simulation provided by ultra high resolutions obtained from NASA, and the view is quite stunning as it provides a visual illustration of how CO2 moves around our earth. 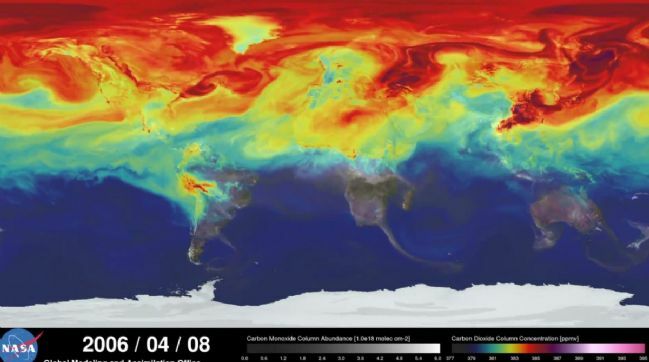 The “Still in Motion” visualization simulation was used to achieve this feat, and this technology uses real data sourced from atmospheric conditions which is made up of greenhouse gases and natural or artificial particles to provide usable information on how carbon-dioxide circulates the world and aerates our environments.